Cook pasta as directed on the box. Once cooked, rinse the pasta in cold water, drain well and reserve . Cut into small cube the pepper, baby carrots , celery stalks . 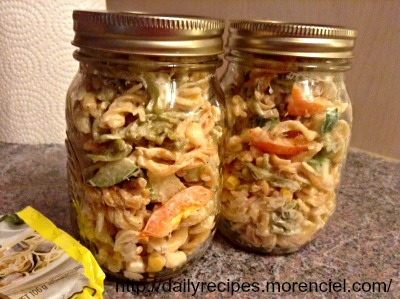 After all vegetables are cut and put into the dish, add the pasta and mix the ingredients. Refrigerate for 1 hour to let it macerate. Add Italian dressing . Mix well to coat all ingredients. Add mayonnaise in small portions and taste after each addition to be sure that there is not too much mayo in the preparation. Add salt and pepper to taste , and parmesan.